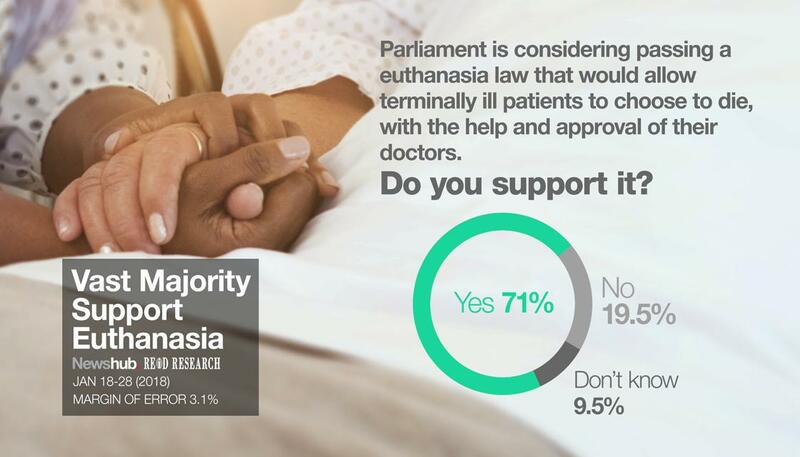 For years polls have indicated significant majority support for legalising some sort of assisted dying/assisted suicide/euthanasia. Opponents of the End of Life Choice Bill currently working it’s way through Parliament have been trying to discredit the polls and have falsely claimed a majority of submissions on the Bill represents some sort of majority opposition. Groups who oppose euthanasia, in particular the Catholic Church, organised submissions to boost the opposing numbers – see Record number of submissions on euthanasia Bill. In a debate on Newshub Nation yesterday Peter Thirkell from anti-euthanasia group Care Alliance promoted the submission numbers while dismissing poll history. Thirkell: Well, polls are fairly whimsical things. They tend to be single-question things. They’re usually framed in a way— They use soft language like ‘assisted dying’, ‘with the approval and assistance of the doctor’, and, you know, ‘given certain safeguards’. That seems to describe the aims of the bill. That really doesn’t carry the weight of expert evidence. There were 54,000 pages of evidence that went to the select committee. Over 600 doctors wrote in, and 93 per cent of them were opposed; 800 nurses, 93% opposed. So almost 2000 medical professionals, and 94 per cent of them were opposed, so these are the experts that are speaking out on the bill. There was not 38,000 experts submitting on the bill – ‘experts’ were only a very small proportion of the overall number of submitters. The Care Alliance have been disingenuous claiming that a majority of submissions represents public opinion, it doesn’t do anything like that. It mostly indicts an organised campaign to boost the number of submissions opposing the bill. Polls have been asking the following (or similar) question regularly since the 1960s and ’70s: “If a hopelessly ill patient, in great pain, with absolutely no chance of recovering, asks for a lethal dose, so as not to wake again, should the doctor be allowed to give the lethal dose?”, and the number in favour has steadily increased from about 50 to nearly 80 percent. As one commentator said, it would be hard for an uninformed person to say “no” to that question without feeling negligent, dogmatic or insensitive. The question is really about medical standards, not euthanasia. That suggested question is hopelessly slanted and would be terrible for a poll. And “the following (or similar) question” is nothing like questions asked in euthanasia polls. We believe that it is enormously beneficial for the public of New Zealand to be able to establish truth for themselves (with the assistance of a website like this one) rather than to rely on information that may be biased, or that is deliberately kept incomplete. It has been our firm belief, throughout the development of this website, that people will recognise the truth when it is spoken, and that access to more information will empower them to make wiser decisions than if they have partial information, and therefore have a lesser, or shallower understanding of the issues. Their lack of truthfulness would condemn them to hell based on Israel Folau’s recent proclamation. Another survey by Massey University in 2008 gave similar results. Horizon poll in 2017: Q.1 Do you support a law change to allow medical practitioners to assist people to die, where a request has come from a mentally competent patient, 18 years or over, who has end stage terminal disease and irreversible unbearable suffering, e.g. cancer? Q.2 Do you support a law change to allow medical practitioners to assist people to die, where such a request has come from a mentally competent patient, 18 years and over, who has irreversible unbearable suffering which may not cause death in the immediate future, e.g. : motor neurone disease? The current Bill is unlikely to allow euthanasia in that situation. It is likely to require that an illness is terminal with death likely within 6 months. But there is still only 15% oppose or strongly oppose. So very similar results from Colmar Brunton and Reid Research in recent polls, and similar from Horizon, and their questions were nothing like what was suggested above.